Originated from Cuba, Montecristo cigar brings a great synchronization with a medium tobacco taste blended with coffee, cocoa and vanilla flavors. It offers a very steady Monte flavor. It has a great structure. 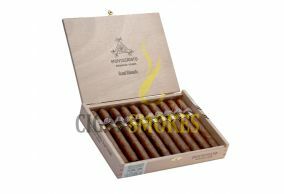 This cigar comes with the format of Cervantes along with the weight of 10.8 g. This smoke is very strong and long too. Very cheap in price, this cigar is very humorous and affordable too. It smells and feels wonderful in the hand.